LE MANS, France -- Audi proved to all that it is ready for the 80th running of the 24 Hours of Le Mans taking the top two qualifying times, but the Toyota team sent a message to the teutonic knights of Ingolstadt that they best not be expecting an easy time of it Saturday and Sunday pushing into third place on the qualifying ladder. As it has done nearly all week the No. 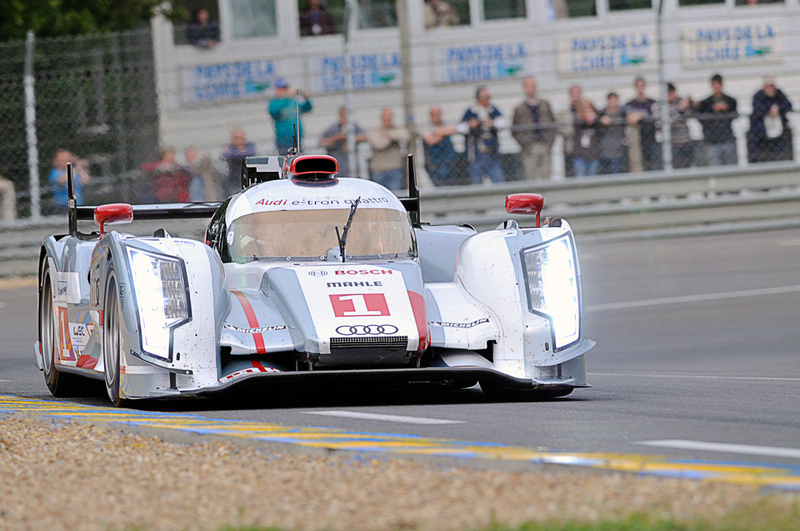 1 Audi R18 e-tron took top honors with Marcel Fassler turning in a 3:23.787 time, the fastest of the weekend. The No. 3 R18 Ultra was second fastest with Loic Duvalat the wheel. He was just under .3 of a second slower. The No. 2 Audi R18 e-tron was fourth as Tom Kristensen made a valiant effort to get back into one of the top three on the last stint of the night. Anthony Davidson, the Brit refugee from the Peugeot laid down the fastest qualifying lap of the weekend for the Toyota 030 Hybrid team. Davidson toured the course about a second slower than Fassler but the message was received by the Audi Team. Davidson also had the fastest time in the S2 segment of the track, proving once again that the Toyotas have a goodly amount of straightaway speed, as noted by Audi driver Allan McNish after Sunday's pre-race test. The Toyota team has continued to improve its lot in life at Le Mans and while no one can now the future, one thing for sure is that Toyota Team will not be a pushover. LM P2 was top qualifying was owned by the Oreca O3 Nissan as Jan Charouz did the honors.He turned a 3:38.181 lap for top time of the evening. The Delta Wing car was a tad over four seconds slower than the leader in the LM P2 class. In GT PRO the Felbermayr team and its 911 Porsche RSR posted top time for the weekend while the GT AM top time went to the Flying Lizards 911 with Spencer Pumpelly at the wheel. Pumpelly toured the course in a time 3:57.594. Awesome Rusty, great pictures and script! Keep up the good work!